I miss a function (or didn't I find it??) to directly copy files from one disc to another. It should be well known for everyone from other burning soft. It should be like that: you insert a disc with files, click "copy disc" (or smth like that) in ImgBurn, then it temporary copies files to HDD, after that you insert a blank disc and it burns the files to it. The Direct CD/DVD copying would be a good solution for those requesting support for compressed image formats like i did (ISZ, DAA, UIF, CISO, etc) or other unsupported formats, because one could simply install a free virtual CD/DVD emulator that supports the requested image (alcohol 52%, Daemon Tools, etc), then use the "1-click copy" to burn from the mounted image to the burner. I know you suggested the "2-clicks copy" method, but that implies decompressing and writing about 4GB to HDD that is already in the HDD but in compressed format. because you would have checkmark the box that says "Switch to Write Mode When Done"
Your method rewrites the image to a supported format, but the purpose behind Direct CD/DVD copying would be not writing to HDD at all, no matter if we are copying from a real CD/DVD or a mounted image on a virtual letter. I originally requested support for ISZ image format to avoid exactly that, but if Direct CD/DVD copying is added to ImgBurn, it will not need to uncompress or support such file formats. The purpose of archiving an ISO in compressed format is to have direct access to it without decompressing first, but that way i can't record it with ImgBurn. If i don't compress it, i can record it but i can't save space. Yes, i know 1 ISO is no reason to cry about free space, i'm thinking big here, as in ALOT more ISOs. 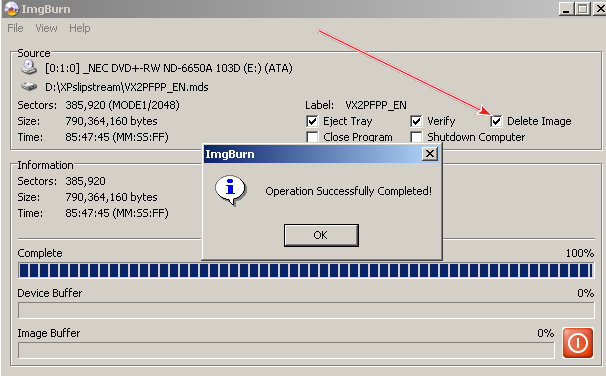 If CD/DVD copying requires creating an image in the process, then don't bother adding this feature to ImgBurn. When i wrote "i know 1 ISO is no reason to cry about free space, i'm thinking big here, as in ALOT more ISOs" i wasn't talking about the ISO Imgburn creates in the process, i meant the backed up ISOs. If i have 1 or 2 ISOs i do not need compression, but if i have ALOT, compression makes a significant difference in terms of space. But we're steering away from the main suggestion, which is: adding a direct CD/DVD copying feature from a CD/DVD reader to a CD/DVD burner, without the need of writing an image to HDD in the process. In my opinion an "on the fly" copy option would complete this software, its been asked for many times before. But we have to respect LUK when he says its not going to happen.